Up to 30 people are feared dead, after an Italian hotel was struck by an avalanche following a series of earthquakes, according to media reports. — Agenzia ANSA (@Agenzia_Ansa) 19 января 2017 г. The disaster happened at the base of the Gran Sasso mountain range near the Rigopiano di Farindola hotel. “Around 30 people are unaccounted for, between guests and workers at the Hotel Rigopiano in Farindola,” Fabrizio Curcio, head of Italy’s civil protection department, told Italian media, as cited by Reuters. The civil agency added that there were up to 20 guests, some of them children, and seven staff members in the three-story hotel. Rescue workers only managed to reach the hotel in the isolated area during the night after the disaster. 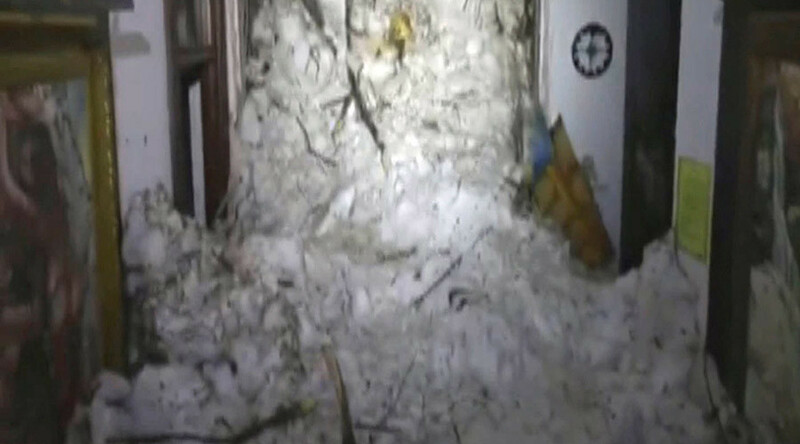 They said what they saw was mostly debris submerged under a mountain of snow, Reuters reported. With the road leading to the hotel clogged with snow, a base camp for rescue teams was set up 10km (6 miles) from the hotel. “We haven’t been able to do too much. The structure has collapsed. It’s more like a pile of rubble than a hotel,” Antonio Crocetta, a member of the Alpine rescue squad who was on the scene, told Reuters by telephone. “We’ve called out but we’ve heard no replies, no voices. We’re digging and looking for people,” he added. Three people have been found dead at the site, Italy's La Repubblica newspaper reported, adding that there is no information so far about their identity. The newspaper also cited a hotel restaurant worker as saying that the guests were waiting to leave the hotel when the avalanche hit. "They had packed their bags, and wanted to go," Quintino Marcello told La Repubblica, adding that the guests were waiting for a snowplow to clear the roads, but it had been delayed. Some guests desperate to leave have messaged rescuers and friends for help, ANSA news agency reported, citing a couple's message that said: "Help, we're dying of cold." The head of a rescue squad that reached the hotel reported that “there are many dead,” as cited on the Italian news agency ANSA’s website. The hotel had partly collapsed and was partially submerged by snow, the agency added. Two people who were found outside the hotel have been transported to safety. “I’m safe because I went to get something in the car,” said 38-year-old Giampaolo Parete, a survivor whose wife and the two children are under the rubble, as cited by ANSA. “I was submerged by the snow, but managed to get out,” he added. — Polizia di Stato (@poliziadistato) 19 января 2017 г. Witnesses told ANSA that the avalanche was of incredible strength for the area, and rescuers had been delayed by a snowstorm. The advance party reached the hotel only after a 10-kilometer cross country ski trek. 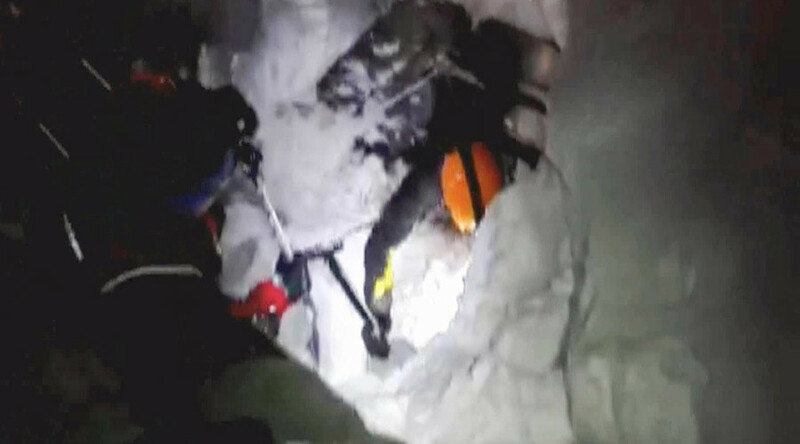 The rescue efforts are being hampered by five meters of snow, other officials said, as quoted by Reuters. “We’re dropping our rescue units down by helicopter and they are starting to dig,” said Luca Cari, spokesman for the national fire brigades, as cited by Reuters. On Thursday, the president of Pescara province wrote on Facebook that there were 20 guests at the hotel when it was buried by the avalanche, as cited by AP. “What is certain is that the building took a direct hit from the avalanche, to the point that it was moved by 10 meters,” he added, as quoted by AFP. The Gran Sasso Resort Farindola (Pescara) is a situated some 1,200 meters above sea level. In the nearby Teramo province, a man has died under a collapsed building, while another person is missing. Ten people, including a baby, have been saved from under the snow, ANSA reported on Thursday. In some areas "thousands of people" remain cut off, officials said. Central Italy was struck by a series of earthquakes on Wednesday, measuring up to magnitude 5.7, with tremors reportedly felt across the regions of Abruzzo, Marche and Lazio – including the city of Rome. 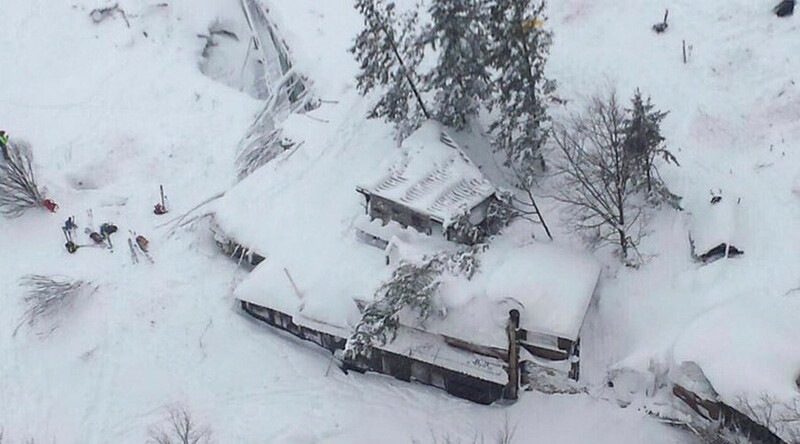 In addition to the quakes, the country has been pounded by heavy snowfall and rain. The Civil Protection department in the Marche region announced an alarm for possible avalanches. There are also concerns that a river in Pescara might soon burst its banks. Some 100,000 people have been left without electricity in the region of Abruzzo after heavy snowfalls, ANSA reports.